We don’t pretend to know what each Sleep Clinic uses in equipment or what the room will do when we make the mattress of their choice disappear. 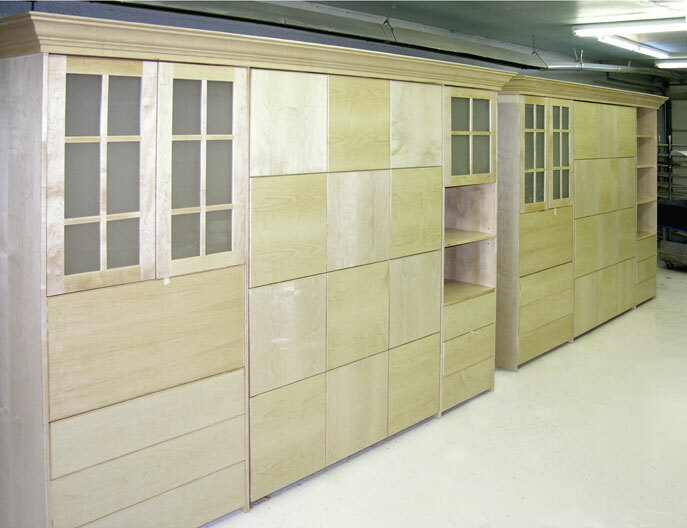 Their description will allow our Murphy Bed Design Staff to create the perfect Dual-Purpose room with our customized murphy beds for sleep clinics. The glass doors are frosted so that medical supplies are seen but not blatant. The drop wood desk on the left is perfect for Sleep Clinic doctor-patient interviews. The first drawer has a deck on the top that doubles as a night stand when the bed is lowered. The sloped headboard is perfect for not allowing the pillows to escape. Noise-damping equipment alcoves and electric panel access are paramount. Also note that the extruded metal frame has no patient weight limit: perfect for morbidly obese patients. Ideally the murphy beds for sleep clinics design will mimic a residential furniture theme, without the cold Sleep Clinic feel. You know it is going to be hard enough to sleep without making it uncomfortable. Any real mattress. Any wood. Any size Murphy Bed. Grab a pillow and try on this mask! Now be comfortable. Right! Many of our clients or their guests use CPAP machines at night. Ask us about adding our newly developed CPAP compartment to your Murphy bed. Katie designed this system for the professional Sleep Clinic doctors in Chicago. Since this manufacture we have been awarded contracts for Denver and Tulsa Sleep Centers. I had been in this business 29 years and had never thought to suggest our Murphy Beds for the Sleep Center industry. Good going Katie! 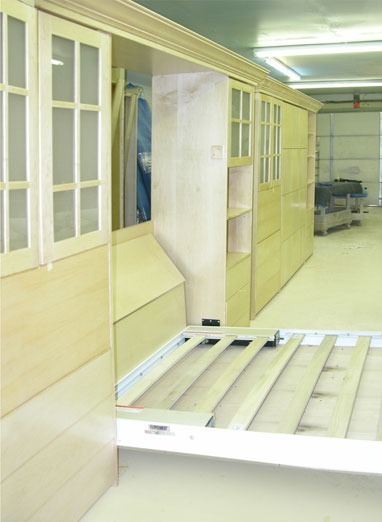 Murphy beds for sleep clinics allow for having a modular work space. This translates to the ability to accommodate more area for other uses, allows for extra comfort for patients and clients, and engenders a decrease in overall operating costs. With aesthetically pleasing designs that are fully customizable, murphy beds for sleep clinics will allow any organization to build their vision.